Don’t write the 2017-18 snow season off just yet Mt. Hood Meadows is still in the think of it with an expected three feet of the fresh stuff by Saturday, April 14, 2018. Vice President of Marketing Dave Tragethon says it is definitely still winter on the mountain, saying, “It’s awesome to have this kind of powder skiing when so many other ski areas across the country have already closed for the season.” Meadows continues daily operations through April 22, and then operates Fridays – Sundays for the next two weekends (April 27, 28, 29 and May 4, 5, 6). A season ending party is scheduled Saturday, May 12, the resort’s last day of winter operations. There’s a lot coming up including reVegetate, 11th annual Sno-Kona Pond Skim, and much more. So get up and take one last bite before you shift into summer mode. For the official word, follow the jump. April powder is delighting Mt. Hood snow enthusiasts and fueling the late season at Mt. Hood Meadows. The resort has accumulated 410 inches of snow so far this season, and should reach the 430 inch average mark by this weekend based forecast snow amounts from the current major winter storm. Meadows currently has a mid-mountain snow depth of 160 inches, and over 100 inches in the base area. Vice President of Marketing Dave Tragethon says it is definitely still winter on the mountain, saying, “This is a major winter storm that’s already dropped a half-a-foot of powder and could delight us with another two feet by Saturday. 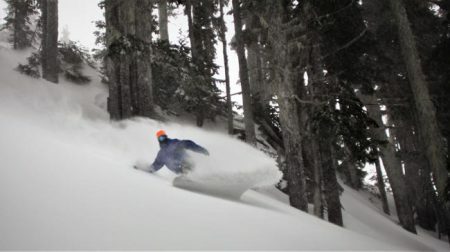 It’s awesome to have this kind of powder skiing when so many other ski areas across the country have already closed for the season.” Meadows continues daily operations through April 22, and then operates Fridays – Sundays for the next two weekends (April 27, 28, 29 and May 4, 5, 6). A season ending party is scheduled Saturday, May 12, the resort’s last day of winter operations. Meadows has a jam-packed weekend of fun and competitive events in store for guests. Saturday, April 14 is the rescheduled Full Sail Banked Slalom event as snowboarders wind through a race course with built up banked turns. At stake are cash prizes and invites to Meadows reVEGETATE freestyle event next weekend. Saturday, April 14 “She Jumps” presents “Get the Girls Out” -va national campaign to unite women as they support, challenge, mentor and inspire each other in the outdoor sports world. “Suits and Boots” will be presented Saturday, April 14 – a fundraiser for the Human Access Project to reclaim river access for swimming along the Willamette River. Guests wearing swimwear will help raise dollars and show their support for the Willamette. Sunday, April 15 marks the last Guided Snow Shoe Tour of the season a guided hike off of the scenic Vista Chairlift (or to the ski areas waterfall areas depending on the weather) followed by dinner at the Alpenstube (must be purchased online in advance). The events season is in full swing at Meadows – the Toyota reVEGETATE freestyle event will be presented April 21 and 22. Saturday, April 21 is a speed and style course – a timed race on a windy course that has six different judged features. The “air style” scores are deducted from the timed run to determine the winners. Sunday, April 22 a rail jam will be presented right in the base area. The event also features live DJs, a vendor village and raises money for the Eagle Creek Fire Restoration Fund, to help reopen hiking trails, restore wildlife habitat and plant new trees in Columbia Gorge damaged by fire last summer. The 11th annual Sno-Kona Pond Skim will be presented Saturday, April 28, with more than 100 skiers and snowboarders attempting to skim across a 100 foot pond. Registration is still available for those brave enough (or crazy enough) to try it. Those that make it across the qualifying run then are judged on costume, style and audience reaction on their second run by celebrity judges. It’s the biggest party on the mountain presented right in the base area and there’s no charge to watch. And coming up in May, Meadows will run lifts Friday – Sunday May 4, 5, 6 and May 12 with a season-ending party scheduled that day. Meadows will put a special $50 lift ticket online to raise funds for the Hood River Area Trail Stewards (HRATS) bring the dream of a Velosolutions Pump Track to Golden Eagle Park, near the Hood River high school. The lift ticket is valid for Saturday, May 5 only and there will be only 200 lift tickets made available. Half of the $50 will go directly to the fundraising effort. Representatives of HRATS will be at Meadows that Saturday to talk about the pump track and other trail improvement projects the organization supports.